Welsh Dragon Ring In Titanium : LOVE2HAVE in the UK! This ring is our Welsh dragon ring. It is an intricate, laser engraved, flat profile ring made from titanium with chamfered edges featuring the well known Welsh Dragon emblem of Wales. The engraving is in panels repeated up to seven times depending on the size of the ring ordered. The designer has advised us that the engraving for this ring takes an hour to complete. The engraved surface itself is quite textured, therefore adding to the ancient Celtic Welsh symbolism depicted. The ring's width is 7mm, and it is available in a satin or polished finish. 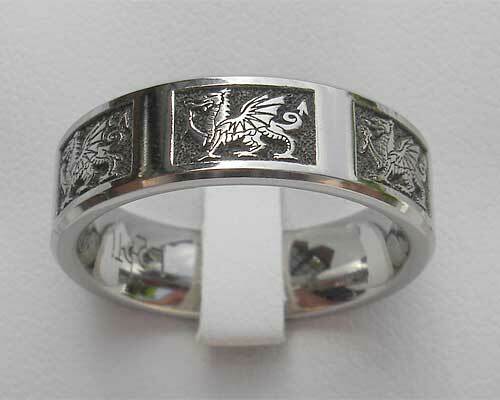 We sell these Welsh Dragon rings regularly to customers all over the world. 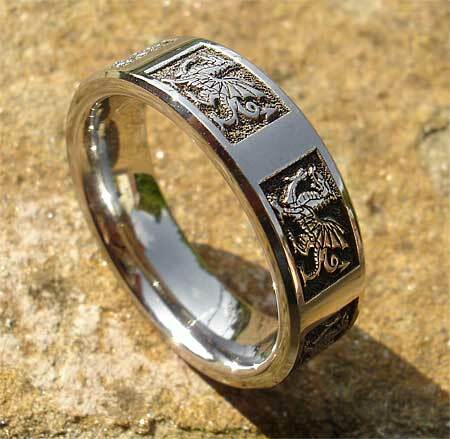 The Welsh Dragon design is world famous and makes a perfect choice of ring for both men and women that love the country of Wales.